Day 2 of BEFFTA awards saw stars come out in large numbers to celebrate one another in an extremely glamorous evening with a record-breaking 88 awards given out. 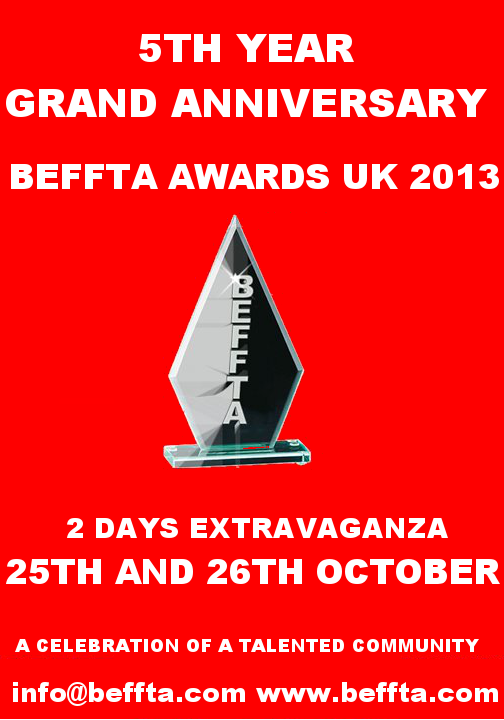 BEFFTA UK awards held over 2 days celebrated talent from entertainment, film, fashion, television and arts. The two nights hosted by BEFFTA founder Pauline Long, Capital Xtra radio personality Abrantee Boateng and poet Alim Kamara were truly inspirational with some of the most unsung talent being honoured. Amongst personalities to receive special honorary awards was entertainment icon BB Seaton, supermodel Nana Afua Antwi received young achiever award and veteran community event organiser and founder of Miss Jamaica UK received BEFFTA female lifetime achievement award. ….. This entry was posted by BEFFTA Editor on October 27, 2013 at 11:24 am, and is filled under NEWS FLASH. Follow any responses to this post through RSS 2.0. Responses are currently closed, but you can trackback from your own site.